Extended Abstracts of a Conference held at the Department of Geology, University of Bergen, Norway, August 1-4th 1996. 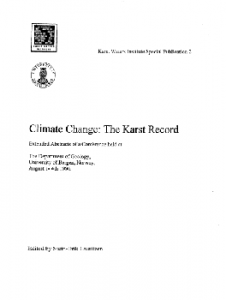 Recommended Citation: Stein-Erik Lauritzen, Ed., 1996, Climate Change: The Karst Record. Extended Abstracts of the symposium held in Bergen, Norway August 1-4th, 1996. Karst Waters Institute Special Publication 3, Karst Waters Institute, Charles Town, West Virginia, 196 p.